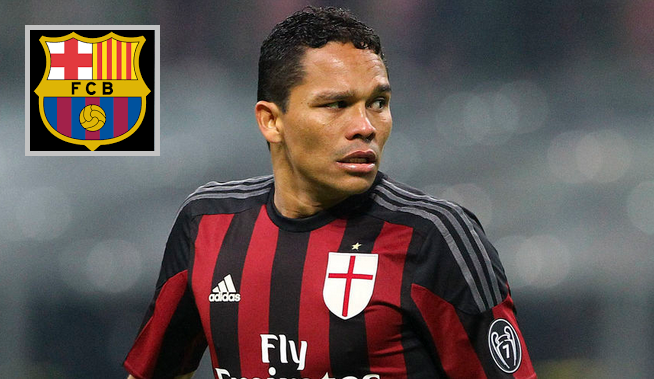 The La Liga champion Barcelona are considering a deal for Colombian Milan striker Carlos Bacca. Spanish giant Barcelona needed to one more forward as the backup of Lionel Messi, Luis Suarez and Neymar. The head coach had not wanted to take risk for absence of three legend. Actually Barcelona needed to appoint at least two back up striker and their first pich has already done with Munir El Haddadi. Now they are searching the second man for the post. They recently shown their interest to former Man United striker Robin Van and the Dutchman is also interested to join Barca side. But all of sudden the Barca boss Luis Enrique targeted the second option to AC Milan striker Carlos Bacca. The Colombian is also keen to join Blaugrana but his parent team did not want to release him and desperate to remain him Serie A side. The Azulgranas set on his alternative choice to Atletico Madrid striker Luciano Vietto on loan. Youngster Vietto is a very talented winger so far and he would be the perfect choice if Barcelona success to cast him in their side. But the twist is that Sevilla are also interested to this 22 years forward. Bacca is a high standard player who joined AC Milan club in 2015 from Sevilla. The Colombian was the potential choice for post who embarked as the top flight footballer. The AC Milan head coach Vincenzo Montella commanded, that was not so easy to release the International standard forward who guarantees goals. He also added that the club also added that it would assisted things with the striker, because he panted to perform in the Champions League so far. He is so phenomenon booster forward at all and his dynamic performance on field just flawless. That was the main reason why the leading club like Arsenal and West Ham also reportedly set their target on this 29 years Colombian forward. It is also learnt to the source that the English Premier League club Everton also trying to set up a link with the Millan star. But the striker deeply interested to join in Catalan side which would gave the chance to play with the three Barca legend. Now Milan are so worried to take the absolute exchange of the Colombian winger. They wanted to consume a chinese fellowship for the Summer. And if the deal has taken place in this Summer windows The Devil will make that sure.